Protocab locomotives contain a Battery, a Locomotive Control Unit connected to your motor, and a Charging Socket. In the Protocab Pilot Series they are controlled wirelessly using a Handheld controller. •The Battery - Supplies traction power for the locomotive's motor and the Protocab circuitry inside the locomotive. 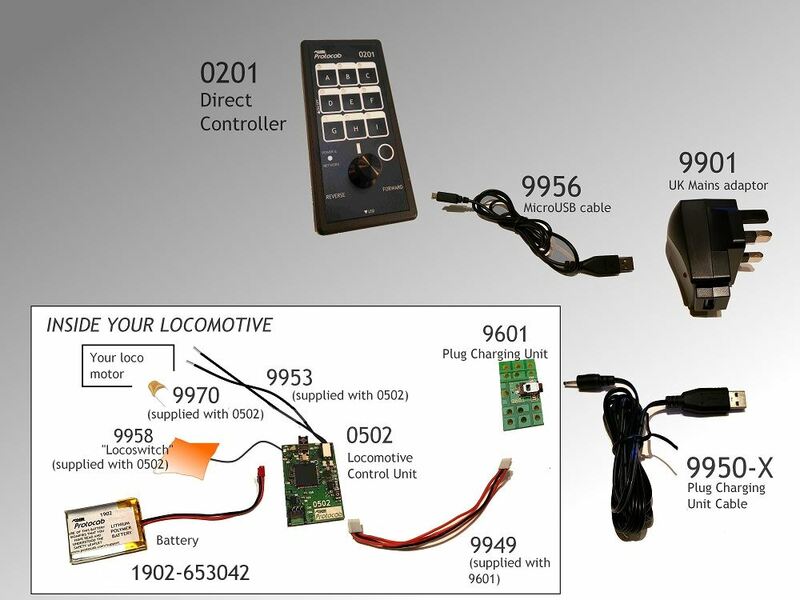 •The Locomotive Control Unit (LCU) - Manages the flow of current from the battery to the locomotive motor using control signals received from the operator via wireless. •The Plug Charging unit - Separated from the LCU to maximise flexibility of where it can be located inside the locomotive, e.g. so it can be placed unobtrusively. How are they connected up? The Protocab components connect together with a unified system of plugs and sockets. These are designed to make it impossible for the wrong plug to be inserted into a socket. The only soldering required is to disconnect the existing connections to the motor (if necessary) and the Protocab LCU wires to be soldered to those motor terminals, along with a noise suppression capacitor included with the LCU.